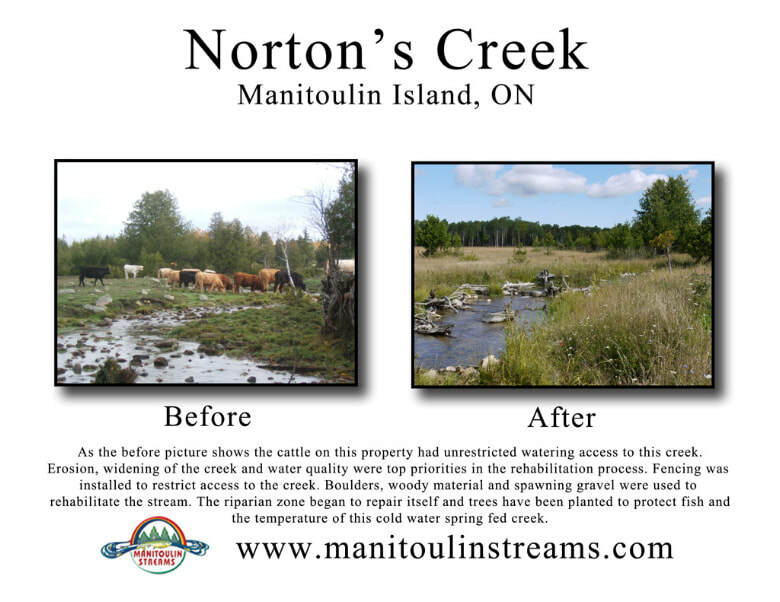 Norton’s Creek has been severely impacted by livestock over the past century. 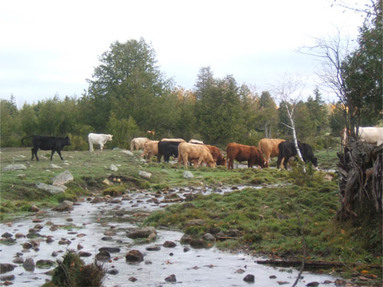 The livestock had destroyed the riparian vegetation and canopy, eroded the shoreline banks which cause sediment to cover over important spawning grounds as well as widening of the creek and reducing the depth of the water. This project’s objective included using bio-engineering techniques such as rehabilitating the channel centre and reducing the rivers width/depth ratio by narrowing and deepening the channel. This stream bank restoration involved stabilizing banks with boulders and creating pool and riffle areas with the placement of weeping and vortex weirs along the creek. Aquatic substrate habitat was created through the extensive addition of spawning gravel, as well as medium and large rock boulders to provide staging areas, and placing boulders along the new shoreline so that it can withstand the force of peak flood flow conditions while providing fish habitat along its edges. Fish habitat was also created by installing LUNKERS made from woody material as well as placing root wads along the shoreline to create shade, shelter and protection from predators. Re-establishment of the riparian zone and its corresponding vegetation/canopy was completed by seeding Right-of-Way grass mixture along the shoreline and planting native riparian vegetation to shade the creek so it cools and reduces the overall water temperatures. Re-vegetation of the riparian area was carried out in disrupted areas along the creek using native species such as eastern white cedar, speckled alder, and heart leaved willow and native grass seed. In addition, fencing was installed to prevent livestock from inhibiting and damaging the creek. Work completed provided habitat for both fish and wildlife. All work was completed by October 18, 2008. There were a total of 300 trees transplanted from the bush line to the creek shoreline, a total of 17,911.56m2 of riparian habitat created, 4 wood duck boxes were donated to the project and installed, 328.5m of electric fencing installed, 222m of rail fencing installed and11, 431.8m2 of land was retired. There was a total of 213 in-stream structures added and a total of 2,058.8m2 of fish and aquatic ecosystem habitat added including (1) sweeper, (23) gravel spawning beds creating 46.8m3 of spawning gravel spawning beds, (3) large boulders 1x1m3 added, (28) LUNKERS were created, (90) pieces of woody material were added, (21) weeping weirs, (5) vortex weirs, (18.5) tandem truck loads of boulders used to stabilize banks, (40) root wads, and (2) single deflectors. In-kind support contributions were in forms of labour and services, equipment, and materials. Labour was completed by the landowner(s) along with the assistance of our partner volunteer groups, (Lake Manitou Area Association, Manitoulin Nature Club, Manitoulin Stewardship Rangers and the Killarney Ontario Stewardship Rangers Program and local volunteers). This project has dramatically improved the aquatic and riparian habitats of this site. This “high visibility” project located along Bidwell Rd. has demonstrated the valued benefits of this community stewardship initiative to the public and other local landowners who were apprehensive about participating. Materials and services for the project (trees, boulders, cedar slabs for fencing, spawning gravel, and operation of tractor) were provided by Bob Hutton (landowner) as well as the Lake Manitou Area Association and Manitoulin Streams members (operation of ATV and trailers). Funds to complete this project were by: CFWIP, COA and NOHFC. 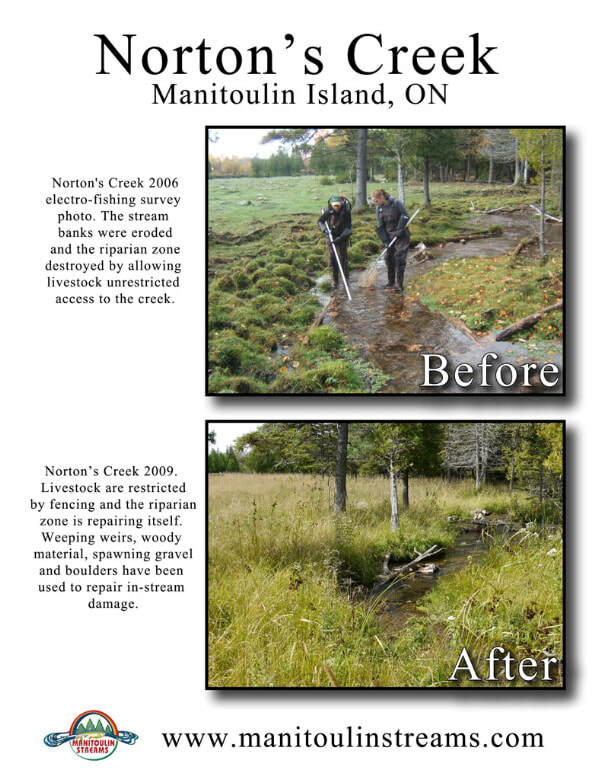 The MNR Manitoulin Stewardship Rangers began work on July 1, 2008 and worked until August 25, 2008. Their group consisted of 1 Stewardship Ranger leader and 4 Stewardship Rangers. They contributed 716.5 hrs of labour, 23 vehicle days and traveled 4,062.4km. The MNR also had 2 Summer Experience Students and 1 Invasive Species Intern volunteer labour. The Killarney Ontario Rangers came and participated in the Norton’s Creek project with 24 rangers and 4 leaders. They contributed 455 hrs of labour, had 5 vehicle days and traveled 1114km. The Lake Manitou Area Association came out to volunteer on Norton’s Creek and they had 9 volunteers that contributed 31.5 hrs of labour and they had members that brought 2 ATV’s that they used to transport materials (gravel, woody material, trees etc.) to various locations along the creek. Twenty (20) volunteers (landowners, local citizens, etc) provided 70 hrs of work. A partnership was developed between Meeker’s Aquaculture (1 person), Manitoulin Streams and Ontario Ministry of Agricultural, Food and Rural Affairs (OMAFRA) (2 people). Meeker’s Aquaculture was to provide 1 tonne (40x 30lb bags) of Meeker Magic Mix compost to help re-establish the vegetation in the area and a summer student from OMAFRA would help in with installation and monitoring of the site. Four wood duck boxes were donated by Paul Methner toward this project. Bob Hutton provided 211 hours of labour and traveled 9,285 km’s from St. Mary’s Ontario to Manitoulin Island during the summer. Other contributions include purchase of 1 dump truck of pea-sized spawning gravel, use of truck and trailer, purchase of 220 cedar slabs, electric fence wire/insulators/posts etc., provided 18.5 truck loads of field boulders to stabilize the shoreline, donated 300 trees from his property to be transplanted along the riparian area, and 40 root wads from his land. He also took an Environmental Farm Plan course and negotiated with the leasing farmer to reduce the number of head of cattle on the property. 5 relatives (Fields Family) of Bob Hutton contributed 29 hours of labour, provided equipment for use (59 hrs of tractor use, use of their chainsaw, and use of their ATV for 7hrs. 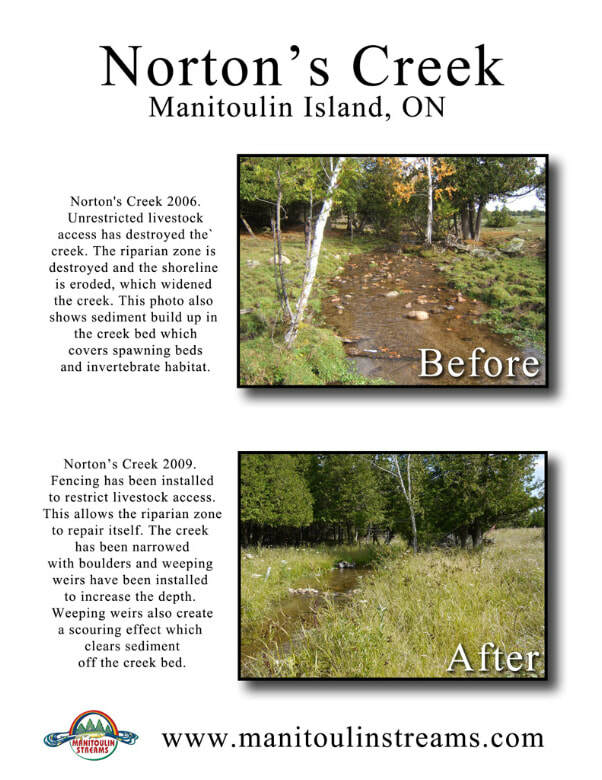 This project had 8 volunteers from the Board of Directors of Manitoulin Streams and 1 Coordinator working on this project at various times. “Manitoulin Streams” Board members (7 meetings, 47 people attending, 151 hrs) attended meetings to discuss planning procedures. The use of an ATV by a Manitoulin Streams member for transporting materials. The project coordinator spent 89.5 hours during numerous meetings with the landowner, organizing partner groups and time spent conducting stream rehabilitation on the creek. An additional 160m of fencing was installed to restrict livestock on November 19, 2008 by 10 hunters over a 2 hour period of time.